Well, here I go. I’m about to do something that I promised myself I would never do. When I started writing these little RV related missives several years ago I resolved that I would never endorse any products by name. Well, as it happens, folks ask me all the time about certain products that I use around the RV. I always answer them the same way; I tell them what I use and that it works for me. I’m usually always quick to mention that there are other similar products that are sold under other brand names that will very likely work just as well. So by popular demand from my loyal readers and fellow RVers, here is a short list of certain products that I use and like. With very few exceptions I am not endorsing these products nor am I advertising them in any way. Consider this article just an informal “campfire discussion” among fellow RVers about what we like to use and what works. Here we go. SteadyFast is a device that stabilizes parked travel trailers and 5th wheels. It works by using three cross braces that are mounted on the frame of the trailer and never need to be removed. 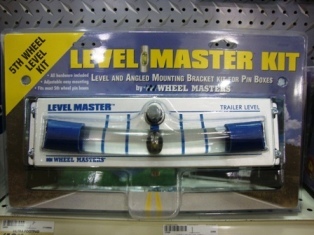 After a trailer is parked, leveled and unhitched from the tow vehicle it takes less than a minute to tighten three locking handles and your rig is stabilized without the need for additional jacks or kingpin tripods. There are a few other similar devices out there on the market, but I really like SteadyFast because it works great and the installation isn’t really that hard. The website is www.steadyfast.com and the toll free phone number is (866) 498-8754. 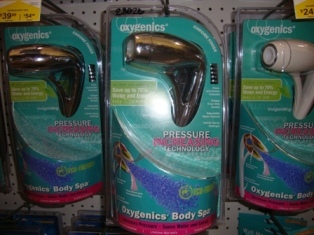 Oxygenics shower head – This is one exception to my rule. I LOVE this thing and if I ever sell my 5th wheel I’m taking it with me. The most common complaint of most RVers is low pressure in the shower. Some folks even operate without a water pressure regulator on the campsite water bib connection in order to get a better shower (Don’t do this!). The Oxygenics shower head uses air and a venturi effect that provides a much better shower even if water pressure is less than ideal. 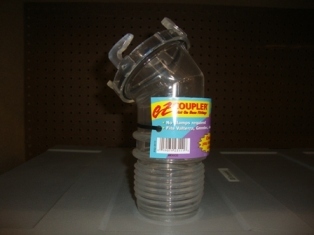 Clear plastic joint for the sewer hose connection. This little device (also called a T--- Counter by one of my friends) enables you to see when the black water that you are draining from your tank becomes acceptably clear and you may stop flushing your tank. This little device will save guesswork, time and water. Pure Power is the sewer chemical that I like to use. It was recommended to me by a friend and it works great. Then using the clear plastic joint (t--- counter) mentioned above I noticed that when I used the little envelops of crystals in the black tank that I would get a level of brown water followed by a level of green water when draining my black tank. This told me right away that the chemical wasn’t really mixing in the tank and therefore not doing a very good job. When using Pure Power, I have noticed that the liquid I observe in the “counter” is now all a uniform golden brown. This product efficiently breaks down solids and toilet paper and liquefies the contents of the black tank very well. 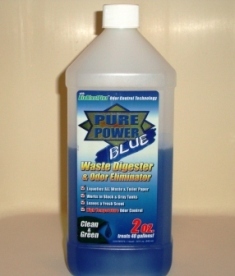 This product uses enzymes to do this so it can’t be mixed with other sewer chemicals and you can’t use any kind of detergent to clean out your tank. This will kill the enzymes. Pure Power by itself will keep your black tank acceptably clean anyway. 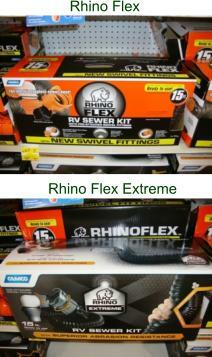 Rhino Flex RV Sewer Hose is what I use when it’s time to drain my tanks. This is a very sturdy waste water hose and holds up very well. 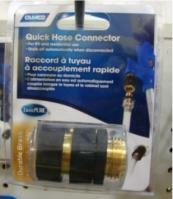 The connections are very easy to use as are the couplings when two or more hoses are needed. These hoses are so well made and so easy to use that I will never go back to the cheaper waste water hoses again. Rhino Flex also makes a heavier duty “extreme” model, but I’ve never used it because it wasn’t on the market yet when I bought my original Rhino Flex hoses and I really don’t believe that my standard Rhino Flex hoses will ever wear out. While we’re on the subject of water, let’s talk about fresh water. I like to use quick connection devices on all my water supply hoses. The quick connectors for fresh water and the black tank flush remain attached to my 5th wheel (with the appropriate covers and/or plugs when not in use) I also leave quick connectors attached to the end of my water filter and utility water connections at the campsite water bib. These make life so easy! You can find them at any hardware store or even at Wal Mart. 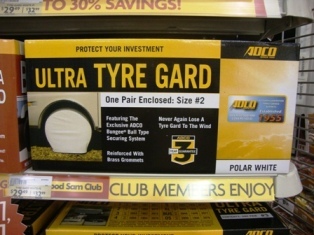 Tyre Gards are the brand name of the tire covers that I use when my RV is parked. If you have read my article on tires you know that I believe in protecting my tires from ultra-violet sunlight. These are much easier to use than anything you might think up yourself (like plywood or something else). 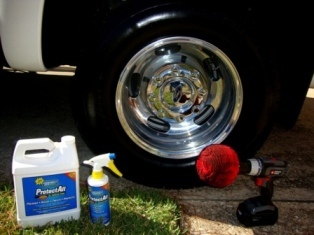 Formula 303 Protectant is what I use to shine and protect the tires on my RV and other vehicles. 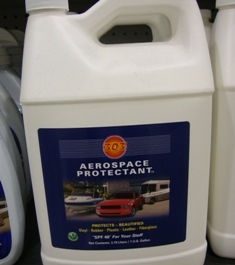 It was developed for the aerospace industry where protection from ultra-violet sunlight is critical. Many other similar products may contain petroleum distillates and other such ingredients that may actually be harmful to your tires. Formula 303 also holds up for a long time and gives tires a nice “new tire” look without appearing too greasy. It also will not throw black gunk all over the front of your trailer while going down the road. on my cordless drill to shine them up. The wheels look nearly chrome and people have even asked me if they were “simulators”. 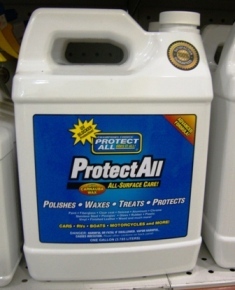 ProtectAll Quick and Easy Wash can be used to wash RVs and other vehicles when the use of water is somewhat restricted. According to the label it requires no rinsing. To be honest, I don’t use this product on a regular basis because I believe in using a lot of water and rinsing the vehicle very well. I do like to use it when an otherwise clean vehicle gets driven through a puddle and a small area needs to be “spot cleaned”. It does seem to work very well and I try to keep a small bottle of it on hand. 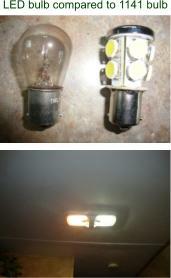 LED lights seem to be the next big thing in illumination. We’ve replaced some of the automotive type 1141 bulbs in our 5th wheel with LED bulbs mainly because they emit much less heat (really no heat at all) than standard incandescent light bulbs. We deemed this to be important once when camping in Las Vegas during July when it was 109 degrees F! The light is also much whiter than that of standard bulbs and we seem to be experiencing much less eye strain since we’ve retrofitted our lights with LED bulbs. A Tank Saver does just that when it is used to clean the debris out of your RV’s water heater tank. Regular water heater maintenance should include removing and possibly replacing the anode rod in your water heater as well as washing out debris such as calcium deposits that are lying in the bottom of your tank. The Tank Saver makes this operation much easier because it has a shut-off valve and the tip is slightly bent so that chunks of debris can be pushed toward the drain. 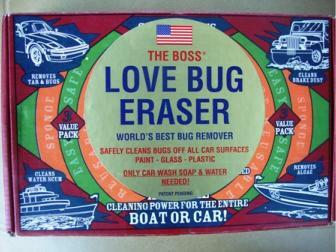 The Love Bug Eraser is the best thing I’ve ever found to take splattered bugs off of the front cap of your trailer of the windshield and front end of your truck or motor home. It is simply a green pad made of some kind of synthetic material something like a “Scotch Brite” pad only not as rough. It easily removes bugs using only your normal car washing detergent and water. There are no other chemicals that will harm the finish or remove your wax. The product can be ordered on line at www.lovebugeraser.com . Here’s a really inexpensive one for you. My wife discovered that regular white vinegar works much better than anything else to clean the shower. 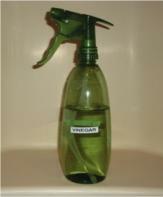 It also works great on glass, sinks and any other hard surface. Sure, it smells like… well… vinegar, but the smell goes away in a few minutes. Just pour some into a pump spray bottle and start cleaning. OK, I’ve saved the most expensive, but possibly the most indispensable item for last. 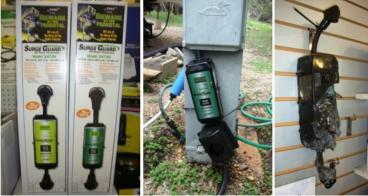 I use the Surge Guard® electrical surge protection device to protect myself, my RV, my friends and my family from catastrophic and possibly deadly electrical eventualities that may be encountered by RVers. This device simply plugs into the outlet on the electrical pedestal at the campsite and then your RVs power cord plugs into the device. The Surge Guard will protect your RV against electrical power surges, lightning strikes and even low voltage conditions that can kill your appliances. I was told by a fellow Texas State Park volunteer that his insurance company paid for repairs to his trailer after a lightning strike caused a surge up the power cord to the camper which “fried” everything electrical on the unit. They also paid for him to get a Surge Guard to protect him in the future and to keep them from paying on future claims like this from him. I know another RVing couple that won’t go to sleep in their rig at night without their Surge Guard in place. Take a look at the picture of the Surge Guard that is displayed behind the counter at the Camping World in New Braunfels, Texas. This one was burned up by a severe spike in electrical current, but there was no harm whatsoever to the camper. I was sold! Well, that’s all the good stuff I can think of at the moment. Like I said before, some of these things may be sold by a competitor under a different name and may work just as well as the products I’ve mentioned. I have only mentioned these things because you, my faithful readers, have asked. I hope this has been helpful to you and will make your RVing experience more enjoyable. If there is a product that you use and like please feel free to tell me about it. I’m always looking for more good things that make my life easier. Better yet – If you sell a competing product similar to anything I’ve mentioned you may send me one (free, of course) and I will give it a fair product evaluation. Warren Petkovsek has been an avid RVer for over several decades. He lives in Lumberton, Texas with his wife, Myra. A former teacher, band director and professional musician, Warren is now retired from the petrochemical industry. In addition to being a freelance writer he is also a school volunteer, a Texas State Park volunteer and has been a Boy Scout Leader for many years. Warren would be delighted to answer any RV related questions that you may have and would be happy to send you some or all of his other articles. He can be contacted at wpetko@sbcglobal.net .